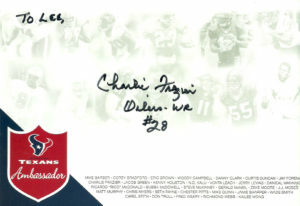 So before the Texans game I spied a few autographs I wanted to get. As usual there was a last second booking change and Charlie was put on the schedule. I was willing to pay the price to get a card of Charlie ‘The Razor’ Frazier expedited, but apparently nobody ever made one. Frazier had some good seasons in there, including a 1,000 yard plus effort there, that earned him AFL All Star honors- so I was really surprised. Going undrafted out of Texas Southern in 1960, Frazier caught on with the local Houston Oilers in 1962. He scored his first touchdown that year in the 3rd game of the season against the Bills on a 73 yard bomb. The Razor’s best season came in 1966 when he logged 57 receptions for 1,129 yards, a robust 19.1 yards per reception, and 12 touchdowns. These all stood as career highs for Charlie. Frazier joined the Boston Patriots in 1969 and was a dangerous endzone target. Of his 19 catches, 7 of them went for touchdowns. After the 1970 season, Frazier retired. A dangerous long bomb threat, Frazier had 6 seasons with a long catch of 50 yards or greater. Currently Charlie lives in the Houston area. He’s a big Texans fan and a member of the Houston Texans Ambassador program. When I got to the game, I could not get to Charlie. I had already found my seats and the stadium had a policy that if you wanted to do events outside you could not re-enter the stadium. The head scratching thing is, the autograph table was located on the concourse inside the stadium and stadium gates, but outside the ticket gates. With a little finagling the ticket manager gave me an exception and let me through. It was a very hot day and long walk to get to Frazier who was seated with Bubba McDowell. We talked about the Oilers and he too was miffed as to why nobody made a card of him. Note: Charlie signed his name ‘CHARLIE’ but his given name is listed as Charley.